But first...thanks to all of you who shopped my Instagram sale! (PS-still some items left here!). And sorry to those of you who had to put up with 20 plus items flooding your feed if you had no interest! Since I'm on the subject of clothes, I thought I'd ask if you've heard of Stitch Fix? 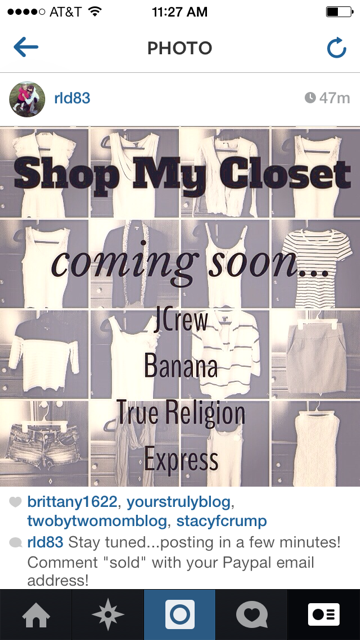 I've been seeing other bloggers and Instagram friends post about it lately. At first, I dismissed it, thinking it was so silly to have someone I didn't even know pick out clothes and accessories and send them to me each month....but the more I contemplate it, the more appealing it becomes! Within the last few years, my wardrobe has gone from business casual, to maternity, to completely casual stay-at-home-mom wear. My style has changed a little bit, but my needs have changed a lot. Comfort and functionality trumps everything these days, but that doesn't mean I want to look frumpy and careless either! I find that when I go into stores (99% of the time with Audrey), I just sort of pick the same styles and colors and call it a day, but then I get home and look in my closet and think "I have nothing to wear!" Or, I have cute things that I like, but I feel like they're totally not working for crawling around the floor with Audrey all day! Agh. Dilemma. 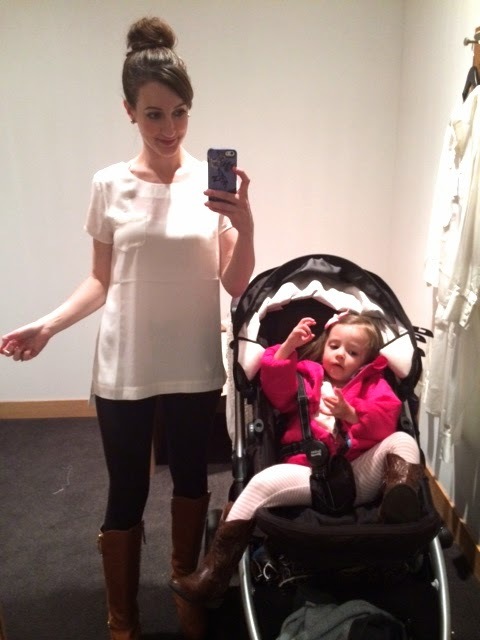 The concept with Stitch Fix is that a stylist picks out 5 items to send to you each month. You fill out information about yourself and take a style quiz so your stylist knows your needs and what you're looking for. You can even select how frequently you want a certain style sent your way. After each box of clothing, you can give additional information to your stylist on what you did and did not like, so that his/her picks for you can become even more on-point. It would be nice to have someone pick things out for me that are on trend and fit my lifestyle without me having to over-think it, or spend time in a dressing room with Audrey (while I give her lollipops to keep her entertained!). I figure, if nothing else, this might save me time and sanity, and I could end up with some cute items that I wouldn't have picked out on my own. Here we are - in a dressing room and she just finished her lollipop! This means, "Wrap it up, Mommy!" Then she threw a fit because I bought a green shirt, and not a pink one! LOL This girl! So what do you guys think? Have you tried Stitch Fix? I'm still kind of on the fence. On one hand, it seems convenient, but on the other, I feel like I might be too picky to benefit from this. I'd love to hear your feedback if you have any! I may just try one month and then cancel if I don't love it! Hey friends! I'm having an Instagram sale right now! Click here! 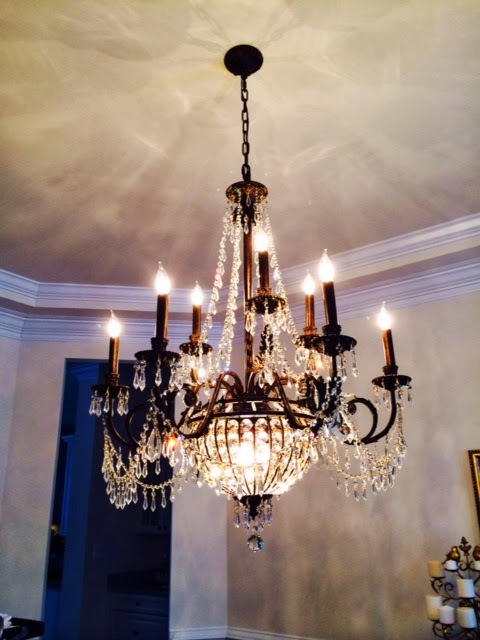 I wanted to show you all some new chandeliers that we had installed this week! We've had most of these in boxes for months, and we're so glad that they're finally up! The rooms that these are in are largely unfinished, so bear with me. 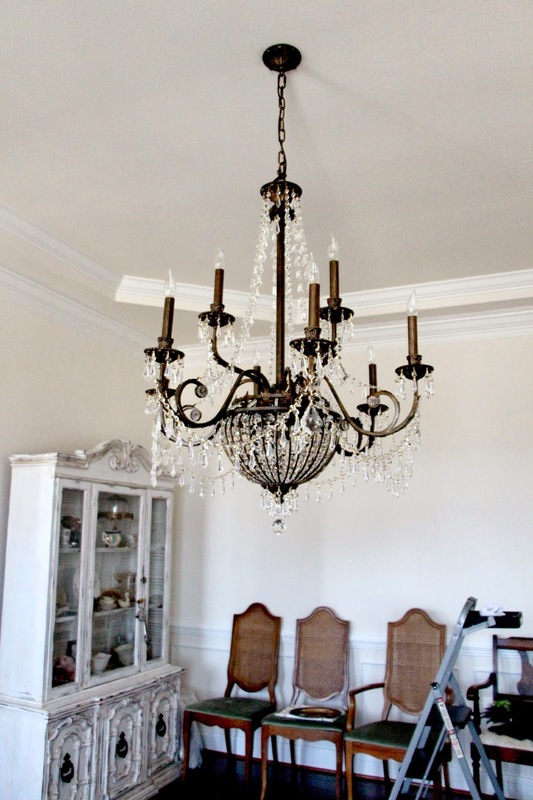 Also, these pictures did not turn out the greatest, but will hopefully give you a good idea of what the chandeliers look like! Here is the playroom. 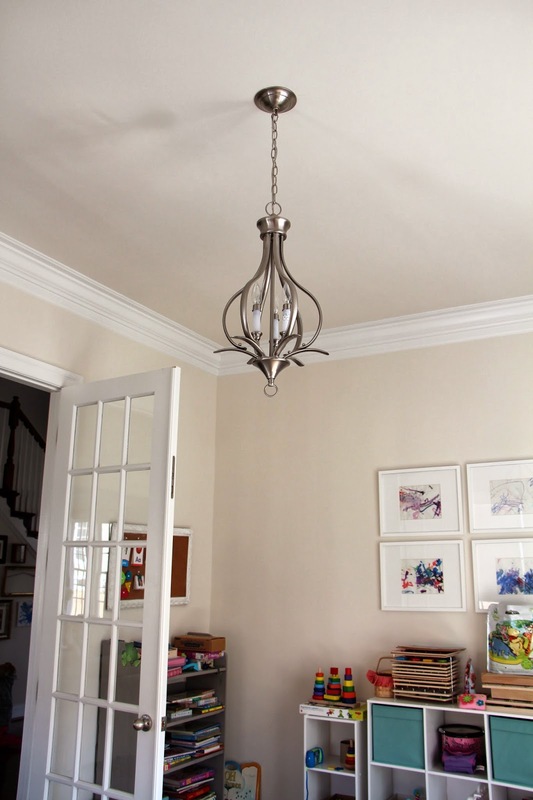 This chandelier is much less exciting than the last one, but it's perfect for the space. It actually was a fixture that we already had. 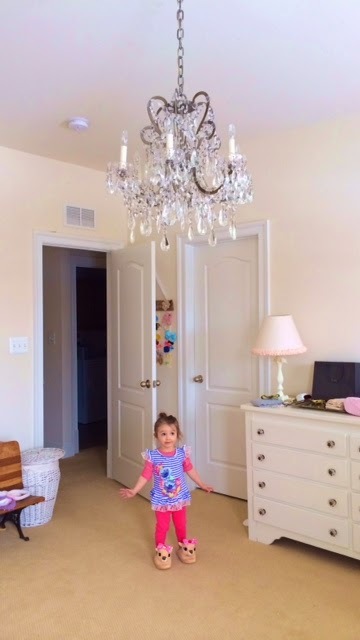 It was installed on one of the landings going up the stairs, but it was right next to the large foyer chandelier, so we felt it was unnecessary there. Moving it to the playroom basically gave us a free light for this room. Yay for that! Next up is the upstairs guest bedroom. This room serves as our main guest room and previously had no overhead light in it. 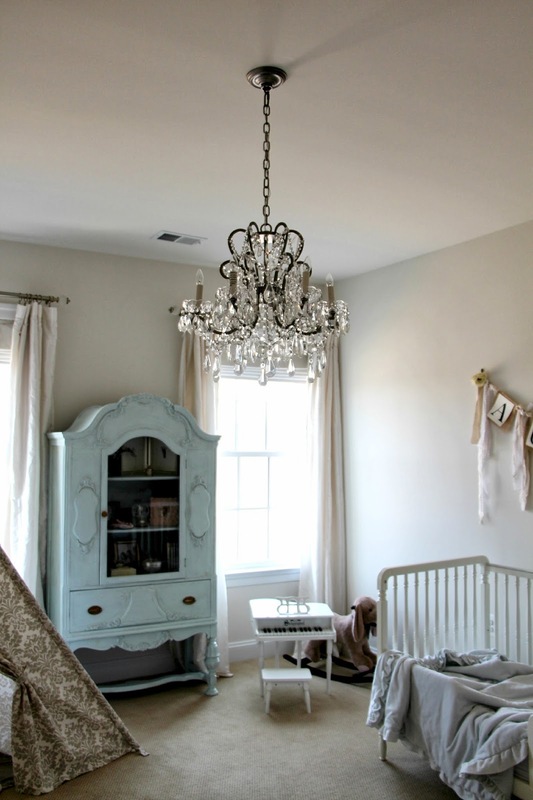 Originally, I chose this chandelier for Audrey's room, but I found something even better for her, which I'll show you in a second. 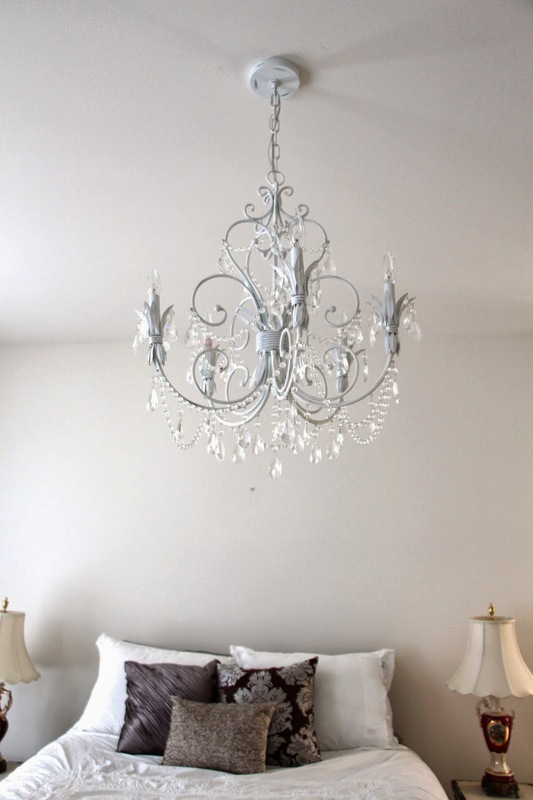 I'm not sure this white and crystal chandelier is what I would have chosen with this guest room in mind, but it's pretty...and plus, it was a good price and I had it for months, so I doubt I would have been able to return it! Now, for Audrey's room. 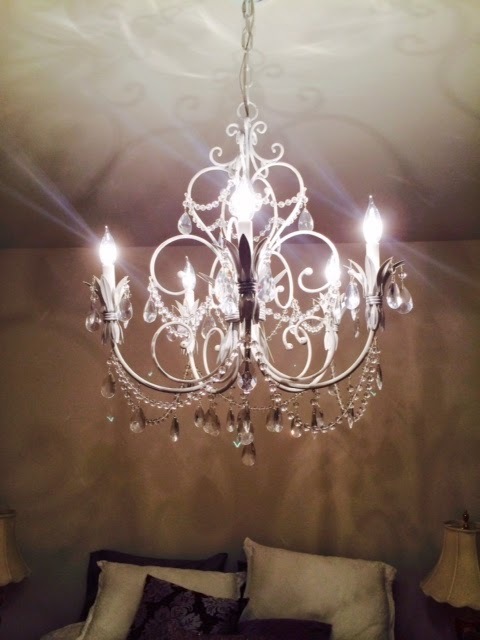 We stumbled upon this gorgeous crystal chandelier at Restoration Hardware Outlet last weekend. It was on sale for $130 (regularly $500 at RH Baby and Child). We couldn't believe it was such an amazing deal and scooped it up without a second thought! I think it's safe to say Audrey loves it. 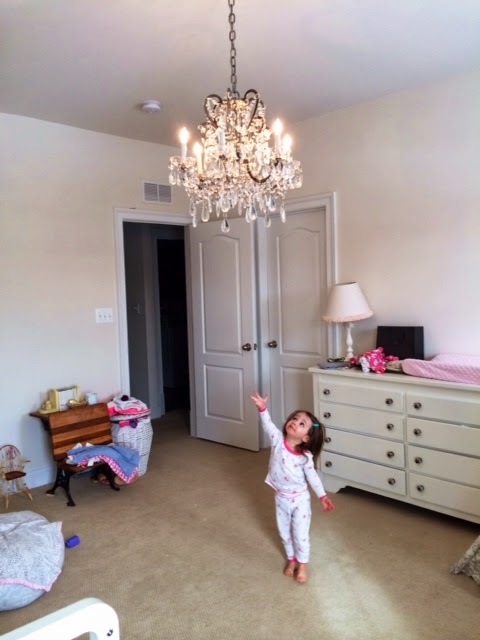 She calls all the new chandeliers "my beautiful new light"! Haha, such a cutie, and a girl after my own heart! Surprisingly, we still need lights for a few more rooms! Hopefully I'll have more to show you soon! This is a simple, yet life-changing recipe that I've been using for quite a while. It's about time I share it! It's so useful in any recipe that calls for cream of chicken (or cream of anything) soup. It's a super healthy and smart replacement for processed, cream based soups. Now you can make all of your favorite recipes so much healthier with this homemade cream of chicken soup! Yay for that! Pour chicken broth and 1/2 cup of the milk in a saucepan, and bring to a low boil. In a small bowl, mix the flour and seasonings into the remaining 1 cup of milk until it reaches a smooth consistency. Pour the flour and milk mixture into the saucepan while it's on low heat. Whisk continuously to avoid a lumpy texture. Let the mixture simmer, while whisking for about 5-10 minutes until smooth and thick. Use as a replacement for condensed soup in your recipes! Hope you guys love this one! I really think you will!